Sometimes I have to kick my husband out of the chair, because it is so comfortable. The chair benefits much more than the lymphatic system. It can also relieve back pain, reduce stress and increase creativity! Most inversion chairs are manual, meaning you have to draw your legs in towards you and use your stomach muscles to push your weight back into the chair. Your weight is what leans the chair back. It takes a few tries, but you will get the knack of it. You do not have to go all the way back every time. You can go as far or as little as you like. Stop by securing the position with a hand lock. Sometimes I lean the chair back a little and then give my legs an added lift with this leg pillow. A word of caution: in the years since I have owned the inversion chair, I have developed heartburn issues. That may in part be attributed to the fact that I spend a greater-than-average amount of time with my legs elevated, allowing stomach acid to reflux into the esophagus. Sometimes caring for our lymphedema can have unintended affects on other parts or systems of our bodies, which is sure to be a recurring theme in my Lymphedema Diary. 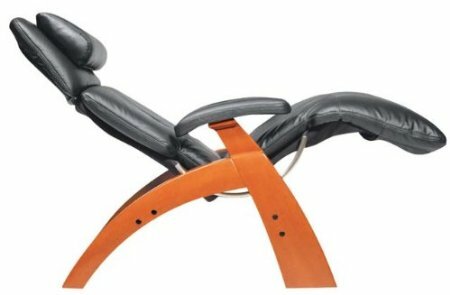 *The exact Homedics model inversion chair that I have was sold through QVC, but no longer appears to be available on the market. The Tony Little model is the closest to the chair I have.